St. Petersburg native Elena Bobrova is RBTH's country editor for the United States. Here she tells the story of her family during some of the darkest days of World War II. Last Monday, St. Petersburg celebrated the 70th anniversary of the breaking of the Siege of Leningrad. So I spent a lot of time thinking about this event, and about history. Especially since a debate on the cost of the victory sparked by the Dozhd TV channel provoked such a huge discussion on the subject in Russian society and the media. It would be no exaggeration to say that the family of every native citizen of St. Petersburg was touched by the blockade, which lasted almost 900 days. My family is no exception: I’m a third-generation “Peterburzhenka” (this is the name given to inhabitants of St. Petersburg). My grandmother came to Leningrad to study medicine in the mid-1930s and my mother was born there in March 1941, just a couple of months before WWII spread to Russia. All of my grandmother’s coursemates went off to serve in the army as doctors, but since she had a 6-month-old baby, she was evacuated with her child to Tashkent in Uzbekistan in August 1941. I never knew my grandfather, because he died fighting for the Red Army in 1943. After the war my grandmother began to think about coming back to Leningrad, and she visited the city in 1950. She took my 9-year-old mother back to their old communal apartment on the Petrograd Side and found that another family had moved into their room. Still, they lived for several months in the room of their neighbors, three old women who managed to survive during the siege and had a lot of sympathy for my grandmother. Interestingly my mother became a best friend with a kid from the family who had occupied their room. And later, in the 1960s, my mother came back to the city to continue her studies and ended up staying there. Nobody from our family lived in Leningrad during the siege, but still I feel a great attachment to that time, because some of our family friends survived there. In the last grade of school I was lucky to have a very passionate and professional history teacher, who devoted a lot of attention to WWII - we even listened to war songs in the classroom. This is what led me to read “The Blockade Book” by Daniil Granin and Ales Adamovich when I was 16. This documentary book was banned for many years in the USSR - those days weren’t celebrated; people were forced to forget that time, because digging too deep could harm the positive image of the Soviet authorities. The Blockade Book made a great impression on me; it changed my attitude to throwing away food and bread in particular. Even now, my friends sometimes make fun of the fact that I eat everything I have on my plate, but I was taught that way in my family. Also, in St. Petersburg it’s just very difficult to hide from the past. You go to Anichkov Bridge and see holes from the bombs at one of the pedestals (they have been left there on purpose of course), you can find the same on the church on the Spilled on Blood, and on your way to Pulkovo Airport you encounter the huge Monument to the Heroic Defenders of Leningrad. Some years ago, when I worked for a travel magazine in St. Petersburg, a British colleague of mine went to the St. Petersburg Philharmonic on June 22 (the day Nazi Germany invaded the USSR). That day, as is traditional, the orchestra played Shostakovich’s Symphony No. 7, or the Leningrad Symphony. It’s traditional for the Philharmonic to play it twice a year, the other occasion being on January 27th. Why? Because Dmitry Shostakovich was from Leningrad, and wrote the symphony to support and inspire his nation during the darkest days of the siege. The symphony was premiered in March 1942 in Kuibyshev (now Samara), later by the London Philharmonic Orchestra on 22 June, 1942 in London, and in New York on 19 July, 1942, by the NBC Symphony Orchestra. But can you believe that it was performed in August in 1942 in the Main Hall of the St. Petersburg Philharmonic? In a city which had lost more than half a million people after the first winter from cold, hunger, shelling, and bombardment. My British friend was deeply impressed by that performance, as there were a lot of blokadniki there (people who remained in the city during the blockade), and many people were in tears, including my colleague. This year my mother went to the Philharmonic to listen to the Leningrad Symphony with her friend. I was really happy that last week we at RBTH managed to publish some of the work of Sergei Larenkov. He is not a professional photographer, he is a former navigation officer who works in St. Petersburg’s port. 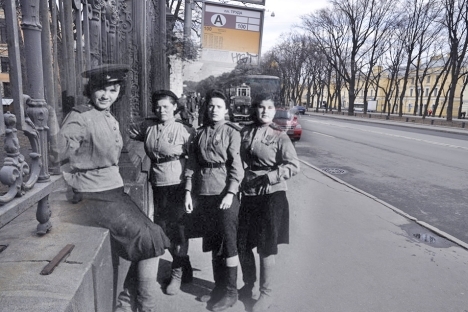 In his photo montages he combines archive photos with modern ones taken on the same spot. Recently he has opened exhibitions in Moscow, St. Petersburg and Kiev, as well as presenting an album of his photographs. But on the other hand I was disappointed by some of our readers’ comments when we published a timeline The chronicles of the Leningrad siege. I know that everyone may be angry and confused by the “gay propaganda law”, but please, let’s just take WWII history seriously and respect those who fought and died. Because next to Soviet soldier could be your great-grandfather. And we all owe these people, because thanks to them we had the chance to be born into a world freed from fascism. January 27th is Holocaust Memorial Day around the world, and I find this symbolic - because for all citizens of Leningrad the siege was their Holocaust.